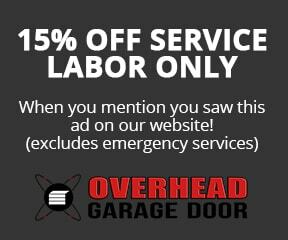 Insulate Your Garage Before Winter - Overhead Garage Door, Inc. The winter may be a season of excitement and stunning snowfall, but when it comes to keeping your garage insulated, the cold air can seriously complicate things. Especially if you use your garage to store important mementos, or even if you use it as a workstation, it’s important to make sure you know how to seal around a garage door. No matter what the thermometer says, with a bit of extra effort, you can easily insulate a garage for the winter season. Doing so will also help to prevent excess moisture (which can easily lead to mold) from building up in your garage. So, what are the tips you need to know when it comes to proper garage insulation? Keep on reading this post to find out. We’ll also let you know where you can find professional garage door repair services you can trust. Before we get into the specifics, let’s quickly talk about why you should insulate a garage. Of course, the most obvious reason is that you want to be comfortable in the colder months. However, staying warm and toasty is far from the only reason why this matters. Have you noticed that, especially during the winter months, your energy bills tend to go sky-high? Especially since the average American household already spends over $2,500 a year on their utility bills, we know you’ll notice a rise in costs almost instantly. Would you like to be able to lower your energy costs and your overall environmental impact at the same time? If so, then garage insulation is one of the most effective ways to do just that. In addition to saving you on your energy and overall utility costs, you’ll enjoy the added durability of a properly insulated garage door. Remember that the winter weather can quickly warp and damage an improperly insulated door. Since these repairs are costly and may lead to a need for a total replacement, it’s important to insulate your door quickly. Additionally, a garage door that’s properly insulated is much quieter. Few things are more irritating than a garage door that squeaks constantly. Plus, this noise level often indicates a larger problem with your door’s gears. Finally, a well-insulated door ensures that your belongings and any vehicles you’re storing inside them are completely protected from the elements. As you’ve likely already guessed, the area around your garage door is where the majority of your warm air can leak out and cold winter air can sneak in. Especially if you’ve noticed a major fluctuation in the temperatures in your garage, poor insulation around the door is likely to blame. So, it makes sense that the first step in learning how to insulate a garage the right way is to pay close attention to the door itself. The truth is that proper insulation is likely best left to the professionals — unless you’re truly a DIY expert. This is because doing it on your own requires you to properly install the retainer pins, the doorstop weather stripping, and even the bottom seal. In short, it’s easy to make mistakes. However, even if you’re not going to handle the project on your own, there are still a few things you should know. First of all, consider the different materials and types of insulation you can use to get the job done. When you’re choosing the type of insulation for your garage, you’ll likely choose between blow-in, batt, and spray. If sound suppression is important to you, ask about options that come with soundproofing. Whatever you decide when it comes to insulation materials (for example, fiberglass or a natural material) one thing is key. Make sure that you choose an insulation material that is completely free from formaldehyde. Now that you have a better understanding of how the process of insulating a garage door works, think about the other ways you can insulate your garage. For example, you may decide that you need to add an epoxy coating to your floor. In addition to a bit of extra insulation, it also serves as a protective agent. Especially if you’ve decided to focus on ceiling insulation, make sure that you don’t use faced insulation. This is because faced insulation comes with an increased risk of catching on fire. Since you’re likely keeping tools like lawnmowers and other potentially combustible items in your garage, it’s always better to play it safe as opposed to sorry. Additionally, talk to a professional about how they plan to leave enough ventilation and airspace. You don’t want to have to deal with a buildup of excess water later on — and the resulting mildew and mold that can often follow. Plus, going with a professional will also ensure that the project is finished in a timely manner. It’s also a much safer route than doing things the DIY way. Get it Done Before Winter Hits! We hope that this post has helped you to better understand how to insulate a garage. Remember that getting professional assistance is always the best bet. Not only will this save you from making costly DIY mistakes. Professionals will also be able to inform you as to whether or not the best option for your garage is a total door replacement. Of course, the quality of the insulation and the overall service depends on the experts you work with. If you live in Chicago and the surrounding areas, we’d love to be able to work with you. Check out our service listings to learn more about how we can help you, and reach out to us to schedule your appointment today.